as Jesus rode on by. *©1998 Abingdon Press, admin. by www.musicservices.org. In five stanzas, “We Sang Our Glad Hosannas” spans the events from Palm Sunday through the Resurrection. In recent years, Palm Sunday observances have been expanded to include the both the triumphal entry of Christ into Jerusalem followed by a transition that points toward the events of Christ’s passion. This hymn provides a perfect bridge from the excitement of Palm Sunday to the somber events of Holy Week. It may also be sung effectively on Maundy Thursday or Good Friday. “We Sang Our Glad Hosannas” is part of a group of hymns that conveys a narrative that pulls the singer into the drama of Christ’s life or a portion of the events that shape his birth, ministry, Passion, and Resurrection. One of the oldest songs available to us that traces the entire arc of Christ’s life is the fifteenth-century hymn, “O Love, How Deep” (The United Methodist Hymnal, 267), translated by British Anglican cleric Benjamin Webb (1819-1885). The traditional English carol “Tomorrow Will Be My Dancing Day” (published in Sandys Christmas Carols Ancient and Modern, 1833) also encompasses the life of Christ. More recently, “Lord of the Dance” (The United Methodist Hymnal, 261) by Sydney Carter (1915-2004) presents a compact version of Christ’s life. Many traditional Christmas carols, such as “The First Noel,” describe the Nativity narrative. More recently, Brian Wren (b. 1936) portrays the post-Resurrection events through the eyes of women in “Women in the Night” (The United Methodist Hymnal, 274). The writer of “We Sang Our Glad Hosannas” seeks to “capture . . . ‘eyewitness’ experiences in her text, emphasizing the tension that built as opposition to Jesus grew stronger and even his own disciples began to desert him” (Citations here and below are from Keithahn and Horman, 27). Mary Nelson Keithahn (b. 1934) is an ordained pastor and certified church education specialist in the United Church of Christ, living in Rapid City, South Dakota. A freelance writer, she has written more than 75 hymns and has contributed many articles for a variety of religious and educational publications. In addition, she has written texts for several children’s musicals. Her most recent publication is Embrace the Light: Reflections on God’s Word (2016), a devotional collection of brief personal reflections, each paired with a passage of Scripture and a prayer. Her primary musical collaborator is John D. Horman (b. 1946), who served for 26 years as a music teacher for the Montgomery County schools in Maryland. He was minister of music at Warner Memorial Presbyterian Church in Silver Springs, Maryland, for 43 year as organist/director. Currently, he is the organist/director at First Congregational Church (UCC) in Washington, D.C. John is a prominent children’s choir clinician and a composer of anthems and children’s musicals. Together, they have published 65 hymns individually and in three collections: Come Away with Me (Nashville: Abingdon Press, 1998), Time Now to Gather (Nashville: Abingdon Press, 1998), The Song Lingers On (Webster, NY: Zimbel Press, 2003), and Faith that Let’s Us Sing (Colfax, NC: Wayne Leupold, 2016). “We Sang Our Glad Hosannas” was included in the second collection, and John has also arranged the hymn as an anthem for combined children’s and SATB choirs. The full text is available at hymnary.org/text/we_sang_our_glad_hosannas. John Horman composed the tune HOLY WEEK for this text. As in his anthems, especially for children, Horman’s melodies have a lyrical quality that allow the inexperienced singer to participate after one hearing. The AA’BA’’ structure contributes to the tune’s singablility and ease of learning. His use of a sparse chromatic harmonic foundation supports the tune and adds musical interest, capturing a portent of the passion drama as the narrative unfolds. The hymn may be heard at youtube.com/watch?v=PAsIpbE2BIo. While the traditional Palm Sunday tune ST. THEODUPH may be sung to this text, it may be best to save the use of that tune for “All Glory, Laud, and Honor” (The United Methodist Hymnal, 280), sung by many congregations as a processional hymn on Palm Sunday. In addition to United Methodist publications, their hymns have been published in several recent hymnals including Voices United (1996) and Community of Christ Sings (2013). Keithahn’s most published hymn, “A Mother Lined a Basket” (1997), a narrative hymn based on based on Exodus 2:1-10, is available in The Faith We Sing (2189). 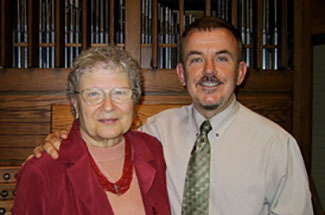 Mary Nelson Keithahn and John D. Horman, http://www.hymnsetc.com/index.html. _____. Time Now to Gather (Nashville: Abingdon Press, 1998). C. Michael Hawn is University Distinguished Professor Emeritus of Church Music and Adjunct Professor and Director of the Doctor of Pastoral Music Program at Perkins School of Theology, Southern Methodist University.